aller wîbes varwe ein bêâ flûrs. wart nie geborn sô schœner lîp. unt ein spansenwe des herzen. Book X verse 508 lines 17-30.
she was the fairest flower of feminine beauty. no lovelier woman was ever born. English translation by A.T. Hatto. hen we compare Richard Wagner's Parsifal with his most obvious source, the epic poem Parzival of Wolfram von Eschenbach, we find that Wagner has taken from it only selectively and what he has taken has been compressed. Not only are the themes of the opera different from those in the poem but so too is the dramatic structure. Wolfram's poem contains two strands, wound about one another like a double helix, with direct and indirect links between them. In one of these strands, Parzival learns that it is his mission to release Anfortas (of the Grail Castle; where his own grandfather is, unknown to Parzival, the old, unseen king who is served by the Grail), and the realm of the Grail. The other strand concerns Gawain, whose mission is to release Orgelûse and the women of the Castle of Marvels (which is also the Castle of Maidens and the Proud Castle) where, unknown to Gawain, his own grandmother is one of the captives. Wagner, who was not interested in contrasting two heroes, cast aside the second of these threads. It was Parsifal alone who was to be the focus of Wagner's story. As always, Wagner formed his material into three climactic situations of violent intensity and in Parsifal the three acts are constructed around the key persons and events to present three successive stages of compassion. Playing no part in the progress of the opera's central characters, Gawain merits only a passing mention. Many other characters who are prominent in the poem -- including Orgelûse -- are never mentioned in the opera. The Castle of Maidens (or of Marvels) does appear, as the setting of the second act of the opera, but the central characters of the action are Parsifal and Kundry, rather than Gawain and Orgelûse. This raises the question of whether the Kundry of act II is in part based upon Wolfram's Orgelûse. Above: In Wagner's opera it is Parsifal and not Gawain who succeeds at the Castle of Maidens, and the proud maiden Orgelûse is replaced by a transformed Kundry. fter reading Wolfram, on turning to Wagner's music-drama we, like Amfortas, miss the presence of Gawain. In Wolfram's poem and in the unfinished Perceval, there is a consistent symmetry: Gawain/Gawan is the almost perfect knight who acts according to the code of chivalry, contrasted with Perceval/ Parzival who follows a less conventional path to perfect knighthood. In these poems it is Gawain/Gawan who succeeds at the Castle of Marvels and so releases a company of women from a curse; while it is Perceval/Parzival who (assuming that the unfinished earlier poem would have followed the same pattern as the later one) succeeds on his second visit to the Grail Castle and so releases a company of men who have been suffering under a curse. agner also merged the characters of Gurnemanz and Trevrizent into one, who is a guide and tutor to young Parsifal in the first act and an elderly hermit in the third act; it is more than possible that when he did this Wagner was thinking of the missionary Barlaam who became a hermit and who was found again by Josaphat. Wagner also merged together three female characters, so that cousin Sigune and Condrie the sorceress became the Kundry of the first act, while Orgelûse became the seductive Kundry of the second half of the second act. Wagner's inspiration, two years after his "Good Friday" conception of the drama, to introduce Kundry into the second act might have been found when re-reading Parzival in which Gawain's sister (who is one of the maidens held captive by Clinschor) is called "sweet Condrie" (die süezen Cundrîê). By transferring the name of Condrie to Orgelûse, then identifying this character with Condrie the sorceress (Cundrîe la surziere), Wagner made Kundry at one stroke a more complex and intriguing individual than the Schopenhauerian metaphor of his initial conception. Left: Gawain marries Orgelûse in this painting from Ludwig's castle of Neuschwanstein. n Wolfram's poem, Orgelûse has been married to Duke Cidegast. As her name suggests, she is a proud lady (French orgueilleuse ). Her husband was killed by Gramoflanz, who also usurped the sacred grove in which he now reigns as King of the Wood (Rex Nemorensis). For details of this ancient legend, the reader is advised to consult the first chapter of Frazer's The Golden Bough. Orgelûse (who can be seen as the classical Diana Nemorensis) seeks a champion who will enter the sacred grove and take from it the garland (the golden bough1 of Frazer's title), then accept the resulting challenge from the King of the Wood and slay him. The victor will then reign with her as the new Priest-King of the Wood. his is the mission of Gawain, which parallels the mission of Parzival (to succeed as Priest-King of the Grail). The two missions are interconnected by Wolfram. For example, Parzival arrives at the Castle of Marvels, where he defeats five of the knights serving Orgelûse. She asks him to be her champion, but Parzival tells her that he already has a mission; she lets him go on his way. There are indirect connections, too, through two distant poles: in the west, the peripatetic court of King Arthur, from which both of Wolfram's heroes have set out; in the east, the court of Queen Secundille, whose magic mirror was stolen by Clinschor, and who sent gifts to Anfortas, one of which was her servant Condrie. olfram's sorcerer Clinschor is often seen as the model for Wagner's Klingsor. As with Condrie the sorceress, however, on close examination these characters do not have much in common with Wagner's roles, beyond their names. There is no direct connection between them in Wolfram, although we can speculate that they have met in India. In Wolfram it is Orgelûse (and the ladies of the Castle of Marvels) who are in the power of Clinschor, an ally of the usurper Gramoflanz. For Clinschor has the art of necromancy at his beck unfailingly, so that he can bind men and women with his spells. He gained this power in India, the poem tells us, after a cuckolded husband had castrated him. Wagner took over the idea of a castrated sorcerer but in the case of Klingsor, the mutilation was self-inflicted. So the Kundry who is in the power of Klingsor, in act 2 of Wagner's drama, is to some extent based on Orgelûse. In Klingsor's castle, however,the women are not imprisoned princesses, but magic creatures created by Klingsor from flowers. nother link between the two strands of Wolfram's Parzival is the wounding of Anfortas. The young Grail King, like many others, gave his heart to the proud and beautiful Orgelûse. In her service, he was attacked and wounded by the poisoned spear of a heathen knight. His wound will not heal. This version of the wound was of no interest to Wagner, however; in his Parsifal the spear is a holy relic carried by Amfortas; while he embraces the beautiful Kundry, the sorcerer Klingsor steals the spear and wounds the Grail King, who escapes with the help of his squire, Gurnemanz. In Wolfram's story, the cause of this dolourous stroke seems to be that Anfortas fell into a trap of pride, which as we know, comes before a fall. In Wagner's reworking, the cause of the misfortune seems to be that Amfortas used the holy spear as a weapon. After it has been guided by an Unseen Hand into the care of Parsifal, unlike Amfortas he carries it with reverence: denn nicht ihn selber durft' ich führen im Streite, unentweih't führ' ich ihn mir zur Seite . Above: Gawain releases the Queens and maidens who have been imprisoned by Clinschor. Mural by Edwin A. Abbey, in the Boston Public Library, Boston MA. n Wolfram's poem Parzival the reformed Orgelûse marries Gawain, the knight who liberated the Castle of Women. In a separate literary tradition it is not Orgelûse but the Loathly Damsel who marries Gawain. Although she corresponds to Wolfram's Condrie there is no suggestion in his Parzival that Orgelûse is the Loathly Damsel in disguise. Wolfram's Condrie actually marries someone else, as does Repanse the Grail bearer. There is no direct precedent for Wagner's identification of Orgelûse (as the beautiful maiden) with Condrie the messenger of the Grail. essie Weston, in her unfinished study of the Perlesvaus, reviewed the variants of this story to be found in the Grail romances. 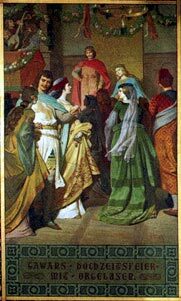 In the Vengeance Raguidel of Raoul de Houdenc, Gawain arrives at a castle of a lady (La Dame du Gaut d'Estroit) who holds a grudge against him: her hand was the prize at a tourney won by Gawain, who had left without claiming his prize. He is recognized and warned by a maidservant, on whose advice he pretends to be someone else, and so escapes unharmed. In that version, the tale makes sense: hell hath no fury like a maiden scorned . The same story is recognizable in the Perlesvaus, although the motivation is unclear; the lady explains that she holds a grudge not only against Gawain but also against Lancelot and Perceval! She demonstrates a hidden guillotine with which she hopes to decapitate all three of them. Gawain is grateful that nobody at the Castle asks his name. In both Chrétien and Wolfram, the lady is scornful rather than scorned, and there is no suggestion of any previous encounter with Gawain. much later version of this tale is found in the compilation known as the Dutch Lancelot, which was probably based on a French original. Here the castle is identified with the Castle of Maidens, which has already been liberated by Galahad. The lady fails to find Gawain and so imprisons another knight, in the hope that Gawain will come to rescue him. Weston concludes, What the original story was it is impossible to say -- whether it was simply a version of the traditional story, or one more analogous to Chrétien and Wolfram of a series of tests imposed on Gawain by a scornful maiden ... the hero of the story was undoubtedly Gawain and the attempt of our author [of the Perlesvaus] to bring the tale within the general framework of his romance by introducing all three questers, Gawain, Lancelot and Perceval, as objects of the lady's affection has only resulted in reducing it to an absurdity ... .
Footnote 1: In the Gawain and Gramoflanz episode, the breaking of a bough is only mentioned by Wolfram and not by Chrétien. This suggests that Wolfram saw a connection with the tradition of the golden bough, one that had not been seen by the poet of the Perceval.